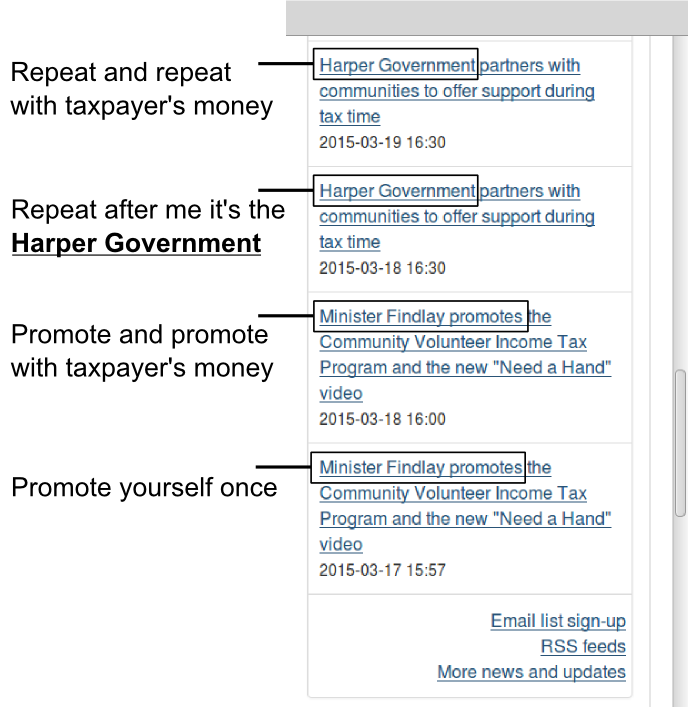 Re-branding the Government of Canada Stephen Harper style. See anything wrong with the picture? Close up of the right pane under news. 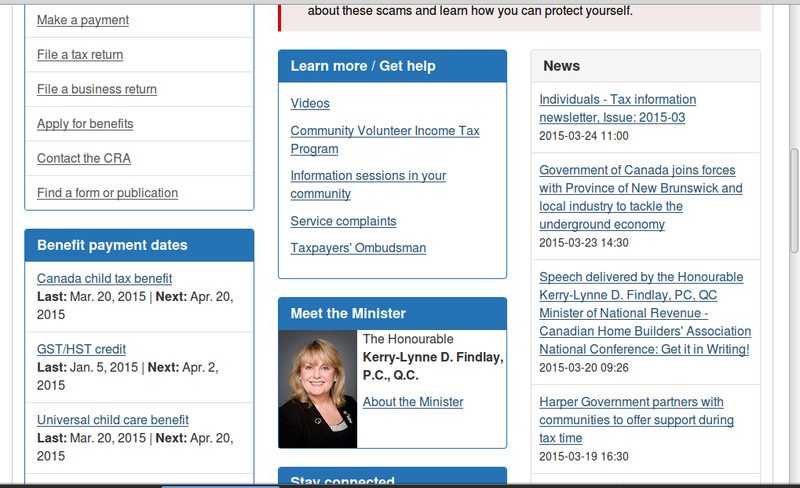 I came across this before when doing my taxes in 2014. I copied the web address but didn’t take a screen shot. The address doesn’t go to any web page now. Oldest at the bottom and newest at the top. 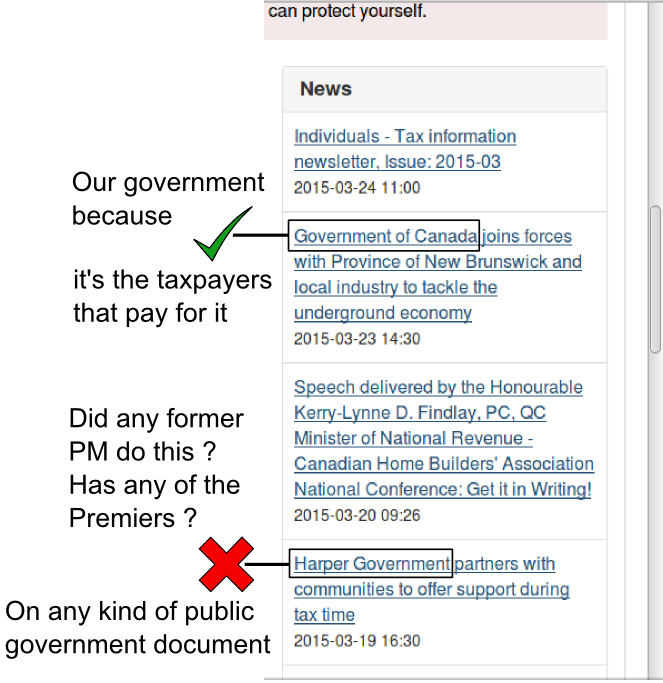 Repeat after me it’s the Harper Government and not the Government of Canada. 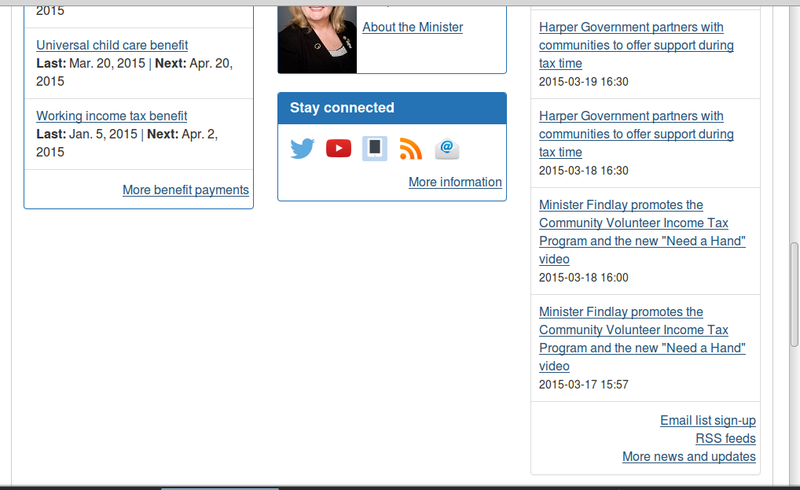 I remember the roll out of Canada’s New government phrase but didn’t know that afterwards they shifted to the “Harper Government”. To me this is illegal, he is not the owner and if the real owners don’t seem to care. What’s to be done? If a government you support can do this than a government you oppose can do it as well. Do you design the system fail safe or fail deadly? An alternative to the current process used in Israel. Swear in the new members of the Knesset. 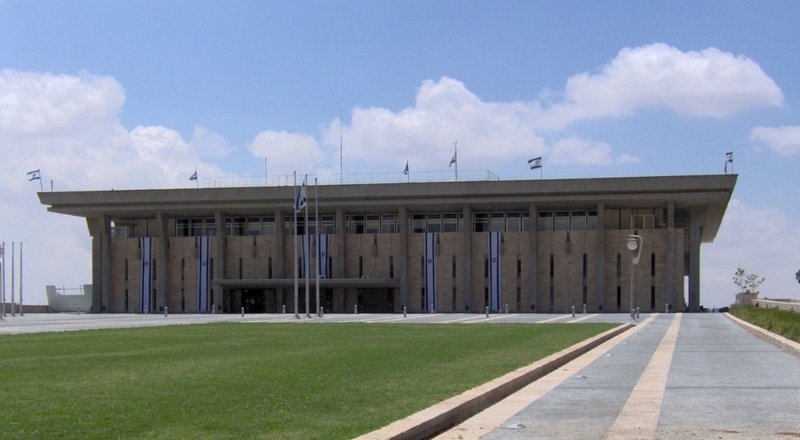 The Speaker ask the Knesset to nominate individuals to be called upon to form a government. A nominee must have at least 6 members endorsing them (5%). If there is more then four nominees then the four with the most endorsements are chosen. Obviously before the Knesset meets there will be intensive negotiations behind the scenes to form a majority coalition. Each nominee then forms a council-designate of say 14-20 members that would form the government should it have the confidence of the Knesset. The Knesset then votes on the question, “which of these councils-designate has the confidence of the Knesset to form the government of Israel in this Knesset. If no council gets a majority then a second vote is held with only the top two from the first vote on it. The council with the majority becomes the Council of Ministers and the runner up council becomes the Council of Opposition. The Knesset has a fixed term and set election day. You can only have early elections by a motion of dissolution passing the Knesset by 90 votes (75%). There are no non confidence motions. The government serves for the duration of the Knesset unless the Knesset passes a motion of dissolution or a motion of dismissal against the government and replaces it with another. Any minister can be removed by a motion of dismissal passed by a 2/3 majority vote with quorum, including the PM. The Council of Ministers can be replaced by a motion of dismissal passed by an absolute 2/3 majority (80). This motion must have a nominee for Prime Minister who is called upon to form a new government if the motion of dismissal against the government gets the 80 votes. No member of the defeated government can be included in this new government. Greater stability since the Knesset establishes confidence in a government right at the start of a new Knesset and the government serves for the duration of that Knesset which has a fixed term and election day. Only by super majorities can this be changed. An absolute 2/3 majority to replace the current government with a new one that then serves till the next election or a 3/4 majority vote that actually does dissolve the Knesset and triggers new elections. Read the title again, that’s right, instead of having daylight saving time have daylight saving hour. Instead of setting the clocks ahead one hour simply put the business and public office hours back one hour. My bank opens up at 10:00 AM on Friday but with daylight saving hours it opens up at 9:00 AM on Monday. My local IGA store will open up at 7AM and close at 10PM on Saturday and on Sunday with daylight saving hours it opens up at 6AM and closes at 9PM. Setting the clocks ahead just does the same effect. The power of Democracy is vested in the majority and in the minority it’s principle. Legislative motions are either Bills or Resolutions. Bills if passed by Parliament become Acts of Parliament and have the force of Law. Resolutions are non-binding legislative motions that if passed by Parliament do not have the force of Law being only an official statement of Parliament. Only the Council of Ministers (the Government) or Council of Opposition (the Opposition) can introduce Bills. Resolutions can be introduced by 1% of the House membership or 4 members. All legislative motions are introduced into the House of Commons. On Monday all legislative motions are introduced into the House of Commons. After any legislative motions are introduced notices of motion of closure are given for any legislative motions including the ones just introduced. This notice is given by the sponsor of that legislative motion. On Tuesday without debate any motions of closure is voted upon. If passed any committee consideration of the legislative motion is stopped and all debate on the House floor for the legislative motion is ended. The legislative motion then goes up for a vote to pass the House of Commons in Legislative session which is every Wednesday afternoon at 1 PM. To pass a motion of closure requires the following votes as a percentage of the full House. 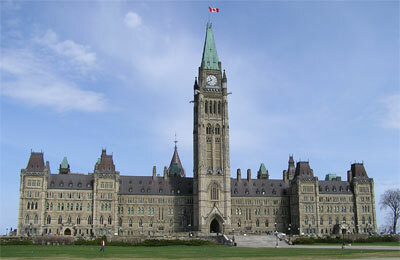 On Wednesday the House of Commons goes into legislative session at 1 PM and votes to pass any legislative motions. The government and opposition each get 10 minutes to make a last speech on the Bill/resolution before the vote. If passed it goes to the Senate. On Thursday the Senate of Canada goes into legislative session at 1 PM and votes on any legislative motions passed by the Commons on Wednesday. If nothing passed the House the Senate will be in regular session. Any legislative motions that passed the Senate on Thursday are given royal assent on Friday by the Governor-General. However you set the necessary votes for a motion of closure the two principles remain. The majority can not be blocked from passing something it has the votes for and the minority can not be ignored or overruled by a simple majority vote.